Every day I express a prayer of gratitude, some days it is just for the fact that I can take a deep breath......other days the list is long. 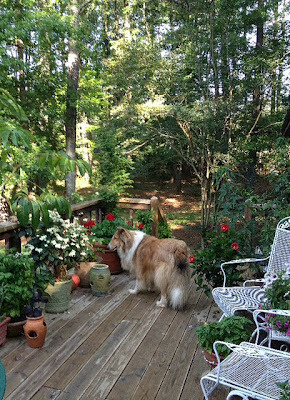 Yesterday morning before I left for my treatment, I stepped out on our deck with Caillou, the Collie, looked around, sipped my coffee and was grateful for all that I saw. It is a little piece of heaven, and I am grateful. My green thumb has been extra green this year. Treatment #4 - the infusion room was busy today......I saw several of my "drip"buddies. There is a camaraderie that builds as you lie in those big green chairs hooked up to a drip. Everyone asks how you're doing, there is always encouragement, and always prayers offered. A couple of folks were not so good today......it is hot, and our air quality is bad.......I worry about them......they're not eating.....do they have air conditioning.......what can I do to help them. they banter with her, they chide her to drink more, but it is obvious they love and adore her. She sits by me and we talk, she is not eating much and it is showing........I encourage her to eat when she goes home today. She wants something to read, I have one of Rick's books in my bag and I give it to her. I want to give her what she needs and wants most, her health, helplessness does not even begin to describe what I feel in that room today. But, she is loved and she dotes on those girls who are with her. I know I should concentrate on my healing, as the slow, thick, cold drip enters my body......but how can I? All around me, there are many who are so much sicker than me......I want to tend to their needs, not mine. A gentleman on the other side of me was very sick, it is hard to comfort him when I am hooked to the drip. He is so thin, so wispy, I am fearful that the wind may blow him away soon. He tells me the heat is taking its toll on him. I am always cold now, the heated blankets are so comforting. One of the women laughs and tell me no no wonder I am cold, I am too little! She wears the most beautiful scarves wrapped around her head......I comment on her scarves, she tells me she will give them to me in exchange for my head of thick hair. I wish I could give her my hair. they must walk a million miles a day, giving, serving, smiling.......I know somewhere there are wings waiting for them. I am the next to the last to leave in the morning group, I look around at the silent room.......I pray that it is a room where healing takes place, I pray for those who work there, that their lives are filled with grace, and I pray that my next visit, I see my drip buddies again. whatever the reason.......that loss of self-respect is profound and takes a long time to recover. The sad thing, most everyone you know has an opinion of you, and most will freely share it with you if given the opportunity. It begins a vicious cycle, a downward spiral if you will......we give others the credit, the power to shape and form how we feel about ourselves.......and we lose who we really are. It's ok, that others think highly of us, or not......but in the end, what we think of ourselves, our respect of self.....is what matters most. Most of life is made up of moments that fade into hours that fade into days, just common ordinary days. My sister and niece cooked lunch for me today. Rick is always telling everyone that my sisters, nieces and I are great cooks. We owe our talents to my mom and all those ordinary days, of cooking in her kitchen. My mother loved to cook.....for everyone. I can remember being three or four years old, helping her in the kitchen. When she was in the kitchen she would talk about everything she was doing. It all seemed so natural, this creating a meal. My brothers cook, my dad cooked. Food was a really important part of our family. We always had a garden, and we all were taught how to grow food. One of the things that momma taught.....you had to cook with love. If you just went in the kitchen and threw a meal together, it was just something to put in your mouth, to ease the hunger. Cooking with love meant using the best ingredients you could, everything as fresh as possible. Cooking with love meant, everyone sitting at the table eating together. One of my girlfriends from highschool told me once, that she came to our house at Christmas, my mom and I were in the kitchen making candy. She said she had never felt so much love in a house. I miss the meals at my mom's house so very much, my mom and I grocery shopping together, deciding on menus. I love table linens, she passed that on to me too, and fresh flowers on the table. I love the fact that she taught me to enjoy food, to enjoy the laughter and love of a table full of friends and family eating together. Jordan loves to help in the kitchen, my mom didn't live to see him, to teach him her kitchen skills, but I am doing my best to pass them on. To show him, that the kitchen is the most important room in the house, and it should always be full of love. Many of you read my blog about my sharing experience with students at the University of Alabama this week. Today, their incredible professor sent me this video......I am speechless. Did anyone miss me? Sorry, I had a rendezvous with a hot young doctor at the hospital......well, maybe it was just the meds or not, but he was awfully cute! Enough about me! how are all of you? 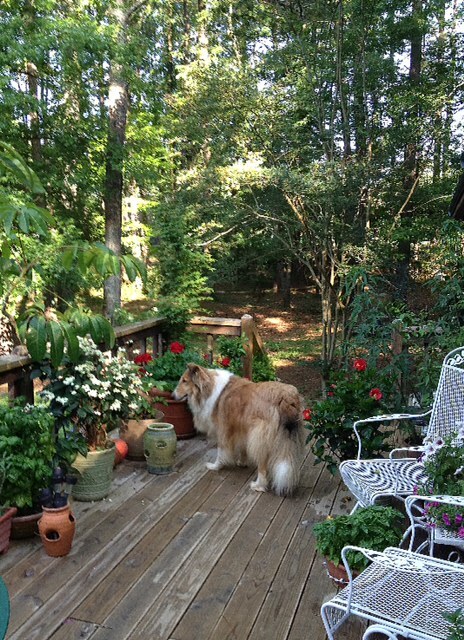 We are living in the "hot country" this week, summer has hit Alabama with its usual sticky sweetness. 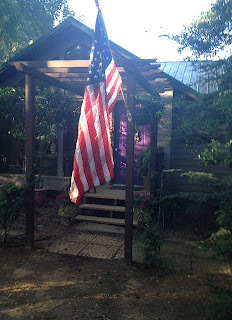 Temps are in the mid-nineties, and the air is so humid........you know that is my theory about why there are so many writers and musicians from the deep south......the humidity.....it does something to the brain. It triggers some sort of release of creative juices in the brain, something akin to brain sweat maybe. Blackie Bear and I have spent the day languidly (don't you love that word?) resting in the cooling dry breeze of the air conditioner. We both have spent quite a bit of time panting......not a pretty sight. I love sharing.......music, hugs, yoga, my passion for what I do. Tonight, for the second time, in as many months I got to share my passion for yoga and my work, with students at the University of Alabama. What an honor!!!! The first time was a thrill, to be invited back was pure joy. to take every opportunity to learn, to have a hobby or an activity that brings you joy, to learn to breathe and relax, to be grateful. They were curious, about yoga, what it is like to teach someone who does not want to learn what you are teaching, how and why I do what I do. They were smart, they shared their thoughts and opinions and spoke honestly about their thoughts on addiction. I encouraged them to spend ten minutes a day in silence, doing nothing, but breathing. It's sad isn't it that someone has to encourage or give us permission to take ten minutes for our well-being. called it. This was her plant, she passed it to my mom, my mom passed it to me. What you see in the photograph is only about one fifth of the actual plant.......it is BIG! I love the beauty of this plant, I love the fact that it has been in my family for at least four decades. I am honored to be its caregiver. For all of you who have given up on your dreams, post this quote so that you see it every day. For those who have forgotten your dreams, find them. For those who buried your dreams, bring them back to life. For those who think you are too old, too sick, too fat, too whatever......throw those thoughts away, and renew your dreams. 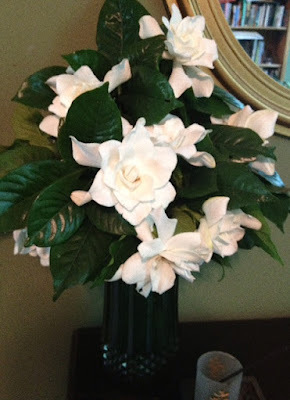 For the next few weeks, our house will smell like Alabama summers......the sweet sultry scent of gardenias will fill the house. Every May, I wait for that first bloom......the soft creamy velvety petals, the deep dark rich green of the leaves, and the fragrance that hangs in the air like Spanish moss in an Oak tree. Gardenias, one of the very best things about Alabama summers. We said goodbye to a an old friend today......she and her husband had been our friends for many years. As a matter of fact, her husband had been my mom's attorney. He had passed away a few years ago.......I knew in my heart when he passed, his wife would be overtaken by grief. Sadly, I was right. Joel and Ann, older friends, but kind and loving and full of life. a Christian who followed the teachings of Jesus and not the rules of some church or political party. He was a Democrat in all the good ways, believing in service, in helping those who could not help themselves, the poor, the hungry. He wore seersucker suits in the summer. Ann was head over heels in love with Joel, she was gracious and beautiful and kind. It was obvious from the first time we met, that in her eyes, there was not another man on the planet like her Joel. When he passed she asked us to sing at his funeral......when she passed this week, their daughter asked us to sing today at Ann's service. I know in my heart, Ann grieved herself to death for her Joel. She was fragile, and could not face life without him. She had not been herself, since Joel died. I hope tonight that their reunion was sweet, I believe their love will last for eternity. Ann and Joel, rest in peace. Your friendship was a wonderful gift. Some days really are diamonds.....Jordan spent the day with Rick and I. He is our great-nephew, he is four and as with all four year olds, he is amazing. We picked blueberries, we painted, I bought him a bubble gun, we fed and watered all the critters. 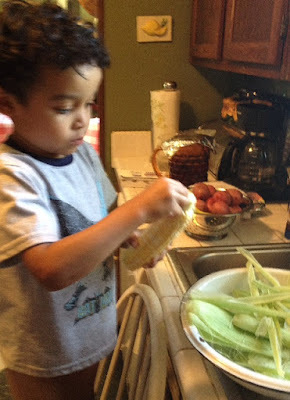 washing the potatoes, the squash, and shucking the corn. he told me I was his best friend. As he took his bath, before his Nana came to get him, he told me with his eyes sparkling, "I've had a great day!" So did I. There are some books that take me through life's changes......each time I read them, they seem to give me what I need or seek. Today I started reading The Rhythm of Life for the third time. The first page talks about choice, that our life is really all about choice and the power we have to live the life we imagine. We can whine about circumstance, or cry about bad luck......but the choice to take and make.......the life we seek, is ours. I needed that reinforcement, that reminder, that I can choose........and that those choices can be good ones. Sometimes, I forget. The last time I saw my friend Mae was in 1965. School was out, summer was just beginning in Chicago and my parents had decided to move back home to Alabama. I cried all the way south. About two months ago, Rick received an e-mail asking him if his wife, Jilda lived in Chicago in the mid 60's.......it was my friend Mae! She and her husband had moved to Jasper from Houston, she had read Rick's weekly column in the local paper and he had mentioned me. Today, I had lunch with Mae. It was as though we had only seen each other yesterday. She was still my friend Mae, bubbly and full of life.......I met her husband Bill......and we tried to play catch up on our lives, but it will take way more than one lunch. She is going to college......she has children and grandchildren......she has some health issues. As we sat and talked, it was just like being back in Chicago.....sitting on the steps of the apartment building where we lived. I truly never thought I would see any of my friends from Stockton School ever again......what a wonderful surprise and gift. Mae, has been back and visited some of our friends, the old neighborhoods and school. I still have family in Chicago, I think I need to visit them. Rick asked me today, after our lunch, if I had ever thought about how different my life would be if my family had stayed in the city. I have thought about it often during the years, but life goes the way it should. I would never have met Rick and all the incredible friends I have today if I had stayed in Chicago. Life is how it should be. This quote seemed to say it all tonight. There is a sweet quaint tradition that takes place here in the deep south each year starting the first weekend in May. It is what we call "decoration day". I am told that it started during the civil war when families placed flowers on soldier's graves in remembrance. My first memory of "decoration day" was when I might have been around five years old......my grandmother Mamie making these beautiful paper flowers, then dipping them in melted paraffin. Then on the first Sunday in June we placed them on family graves at the Dilworth Church of God cemetery. It was an all day family gathering, with dinner on the "grounds" at the small country church and the afternoon was spent walking across the cemetery. The more affluent families placed live flowers on their loved ones grave. 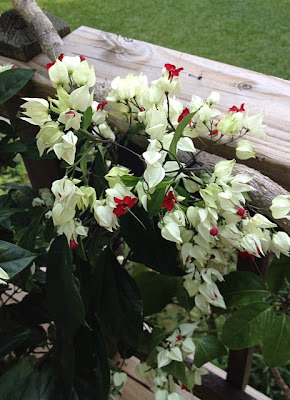 my grandmother's homemade flowers went "out of fashion", live flowers were placed on the graves and then later on, silk flowers. Today was "decoration day" where my parents, brother, and my mom's family are buried. placing flowers in the rain......I remembered them all.......and even though it has been years.......missing them, my mom, dad and brother especially......it was a reminder......life goes on ......and at some point......all you have are the memories. For the love of it.....that is why I sing, that is why I write songs, that is why I play guitar. Through the years, I have met many aspiring singer/songwriters and often some of them talked about making money.......I always share with them something one of my best friends in Nashville told Rick and I years ago.....if the only reason you are in it is for the money, quit now. sharing the stage with friends, playing music and having the time of our lives. What could be better on a Saturday afternoon? and it fills your heart with joy each time you do it. Passion makes you feel alive. Passion makes your heart race, the senses awaken, the whole world looks good. Passion for something, gives a purpose.......passion not only makes you feel alive, it makes you glad you're alive. Rick and I share an office.....most of the time, all is well.....most of the time. Tonight, I am driving him crazy with my chatter, while he is trying to write his blog. The thoughts hit my head so hard and fast, they just spill out sometimes.......and one thing triggers the next......and next thing you know, I am speed talking. Of course, there are nights when he does the same thing to me......but that's different. Ha,ha! We have a really fun gig tomorrow, but it is outdoors and the threat of rain is 70%........it is an Art in the Park function.....outdoors, surrounded by art.....maybe we can do an anti-rain dance. I am on a "high octane" antibiotic......I think they might have slipped diet pills in the script. It is that full of nervous energy, yet exhausted kind of feeling. Ugh! Tonight is one of those nights, I just can't focus, sorry for the jumping around.....be glad you don't share an office with me. Rick and I both graduated from the same high school. Just a small town high school, where every one knew every one, mostly blue collar. When we graduated scholarships were unheard of at our school. A few years ago, we decided to set up a scholarship fund. Tonight we awarded a young man his scholarship. It's not a large amount, but hopefully, it will help him find the path that makes his dreams come true. pushed us to do our best. The most amazing thing.....most of the dreams that I had as that teenage girl, have come true. I believed in myself much more than my counselors and advisers did. They told me I'd make a great secretary or housewife......that is all they saw in my future. Now, secretary or housewife is an honorable profession, but I couldn't even type 25 words per minute.....and I had cooked, cleaned house, washed clothes, baby sitted and care given for most of my young life. I beat the odds, I became a successful regional model, I was one of the first female award winning sports photographers in the state, I was a buyer for a clothing store, and ad director for a newspaper, make-up artist, managed a show room at an apparel market, co-written a number one song and several that have charted across Europe, work as a singer/songwriter, and as a yoga therapist in a rehab center, created jewelry and sold my paintings. Tonight, there were the "golden kids", the ones who were good at everything, sports, beauty, leadership, won tons of scholarships........but you know I wanted to really tell the others, late bloomers rock......through the years, the saddest words I have ever heard are from "golden kids" who bemoan the fact that the best years of their lives were in high school......how heart breaking......life is really just beginning when you burst through those high school doors for the last time.....that is when you truly have just begun to live. Yoga class today......a life in balance. Balance is what most of us seek, but it can be evasive. Balance postures in yoga teach you alot about yourself. If you are one of those who hold your breath during your yoga practice, you know it when you do a balance pose......you have to breath to balance. Do you force your way through life, as well as yoga class......can't force balance. Does your mind bombard you with thoughts from every direction?.......can't do that and balance. Balance postures can be very humbling......yes, I have fallen on my face. Mastering a balance pose can build incredible self esteem. When you are not feeling well, a balance posture will remind you to take care of yourself. You can't multi-task and balance. Finding your balance guides you toward a deeper understanding of yourself......and teaches patience. Finding that sweet spot in balance reminds you that practice makes it obtainable. Today's class was fun, and challenging......there was laughter, occasional groans of despair, and moments of yes! I did it!!!!! Finding balance.....it's worth the effort. Learning to make choices.....you're never too old for this lesson. One of the things that illness has taught me......pick and choose. Once, not too long ago, my theory was I could do everything......and I pretty much did. I truly lived by my mother's words "you can rest when you're dead." Funny how things can change. My body demands attention now, it demands rest, nourishment, and gentle care. The lungs can get down right uppity about it all. Today, an off day for me.......I picked and I chose. Not so long ago, I would have made a list with a dozen or more things to do.....and do them all. Today, I made three or four choices, took a couple of naps, a hot bath and sat in the sun. a musician that I absolutely adore is playing in Birmingham this Friday night, normally I would have been there on the front row singing all the words to every song. Saturday, Rick and I are booked for a gig at a local art in the park event, my choice, stay home Friday night, rest up for the gig Saturday......sorry Paul and Kim. This one was a heart breaker. Rubbish! we all have talents, but we compare them to everyone else's, beat ourselves up about our lack of talent, and throw those gifts that have been handed to us by the universe and God into the garbage pail. Some are incredible cooks, creative bloggers, gifted photographers, caregivers, the best of friends.......everyone of you has creative energy coursing through your body. Maybe you wish it was something different, or you just never developed that early interest, but talent is in every one of us. One of the most incredible talents in the world......the ability to listen, without judgement, another one often goes by without much recognition.....giving with no expectations. My dad could whistle, like real songs.......I can't whistle. Whatever your talents are, don't belittle them, don't hide them.....embrace what you have, what you can do and share them. There are days when I think the best talent in the world would be...... to give hugs to anyone who needs one. Talents are gifts, appreciate yours, be grateful, and use it. Turning the curve, it can be such a subtle thing with chronic illness.....this morning, I had my doubts, but the meds did their magic around noon.....I feel stronger than I have in days. I can breathe and talk without exhaustion.......Life is good. Turning the curve in any part of life can be subtle or frenzied. You make decisions, try new things, meet new people, learn something, let go of something, ........and next thing you know, you have turned the curve. It can happen fast or slow, and it can be scary. Honestly, my favorite part of the roller coaster......it's not the hills and valleys, it's the curves. I love Ingrid my car, because she can take a curve. A straight road may be the safest, but a curvy road is never dull. Turning the curve today, I can't tell you how good it feels, body and spirit back the way they should be, taking a deep breath......WOW! Energy is a good thing. I turned the curve today. not a tux, but a velvet jacket and bow tie and jeans. Not photos, because the minister's wife couldn't work a 35mm camera. Hostess Twinkies and bottle of Boone's Farm wine were the sacraments. Nobody thought it would last. No one attended but the bride, the groom, the minister and his wife. That was 38 years ago today in a little south Alabama town called Brewton, near the Gulf of Mexico. Yep, there has never been anything typical about our marriage.......it has had its share of ups and downs, of good and bad, of wild and crazy, silly and sad. Music has always been a common thread, at times the only common thread......but we knew we were in it for the long haul. long blonde hair, a hippy chick. His momma thought that he had never committed any sins until he married me. It didn't matter what anyone thought, I knew we brought out the best in each other. Our life together has been quite a journey, full of mystery, joy, and adventure......and also times of boredom, disgust and disbelief.....after all that is what life is, that is what marriage is. A commitment, a compromise, a trust, and sometimes just hanging on for the hell of it. So for all those who thought we'd never make it......you were wrong.......we were in it for the long haul. Back at the doc's this afternoon, more antibiotics, another lung infection........I know this too shall pass. I am exhausted from coughing so much......and just for tonight, I am wallowing in self pity. It is ok to wallow, well, you have to give yourself a time limit.....mine is just for tonight. I keep asking myself, are the treatments working? will they work? what happens if they don't? It's ok, I know they will, but tonight.....well you know, I wallow. One of my students told me last week, that she believed my lesson in all of this was to learn surrender.........ok, you win........I SURRENDER. Rain today, the first measurable amount in a few weeks.......a slow gentle downpour, all day. Just what I needed, because I slept most of the day( except when the cough woke me up). I can barely keep my eyes open now, so this will be a short post. I will share a Jordan story......yesterday when his mom picked him up at daycare, he was insistent about bringing a friend home with him. Seems a little girl in his class shares the same love of cartoons that Jordan does, as they talked about their favorite shows, she told Jordan that she didn't have Nick Jr. at her house. Jordan was heart broke, he just wanted to bring the little girl home so they could watch Nick Jr. He is four years old, with a heart of gold. Now, we have to see if the little girl's mom will let her visit. Treatment #3........the infusion center is beginning to feel rather homey. It is interesting how many of my days away from work are spent at some sort of medical facility. I am reminded constantly that the majority of those who work in the medical field, do what they love......and they spread that love to their patients. One of very best friends, Marcia works at the hospital where I was today, she actually spent her break( and probably lunch hour as well) talking to me while the drip did its magic. We are good friends, as well as distant cousins......Marcia actually introduced me to Rick. Actually another cousin introduced me to him in junior high school, but he doesn't remember that. I am not comfortable getting stuck, my veins are small, they roll, Marcia could see it in my eyes, but she chatted away as the needle came into my arm. I am so grateful that she spent some time with me today, the drip is thick and slow, about three hours worth.....it feels like ice water coming into the vein. Those nice warm fluffy blankets......are something else.......they make it all better.....like a band aid on a boo boo. After Marcia left, I napped, as much as I could.....the lungs are full of gunk, trying to work its way out.....my cough is not pleasant, not for me nor those who listen to it. My friend Becky tells me that I sometimes sound like Darth Vader. Ha,ha! We have a routine, Rick goes to the cafeteria or sits in the waiting room with his trusty laptop and writes. People are always recognizing him.....today, I had a new nurse.....she recognized my name and instantly told me that Rick's column is the first thing she reads in the Sunday paper. I promise her next trip, I will bring her an autographed book. After the treatment, I am weak and shaky, but we always go for lunch at one of our favorite places in Birmingham, Nikki's West. Then we come home and I sleep the most wonderful sleep....so deep and peaceful. The strange thing, the sleep is that way for a couple of days......I can't describe how good this sleep is. As I slept on the sofa this evening, Blackie Bear slept on the floor beside me, he never lets me out of his sight. As I watched the drip today, I reminded myself.....this too shall pass......I remind myself......this is good for me.......I remind myself......it could be much worse. A change in attitude.......a big change for me.......tomorrow is treatment day. The first two I dreaded so much, I never slept the night before......and I looked at that drip as though it was the enemy. But, a student and one of my close friends, who have both been through much worse than this shared their wisdom with me this past week. The meds are good, the drip is my best friend, and the days that follow teach me the lesson of surrender. How could I have possibly thought the drip was my enemy? It can give me my life back, renew my energy, and slow and stop all the infections that play havoc in my lungs. This week, I don't go back to work the next day, actually I don't go back to work until Monday.....I know, sometimes I am a wee bit slow. So tomorrow, I face that three hours with gratitude, knowing that it is good stuff, believing that it brings nothing but goodness to my body......and then the next few days......rest. A change in attitude, is all perspective.